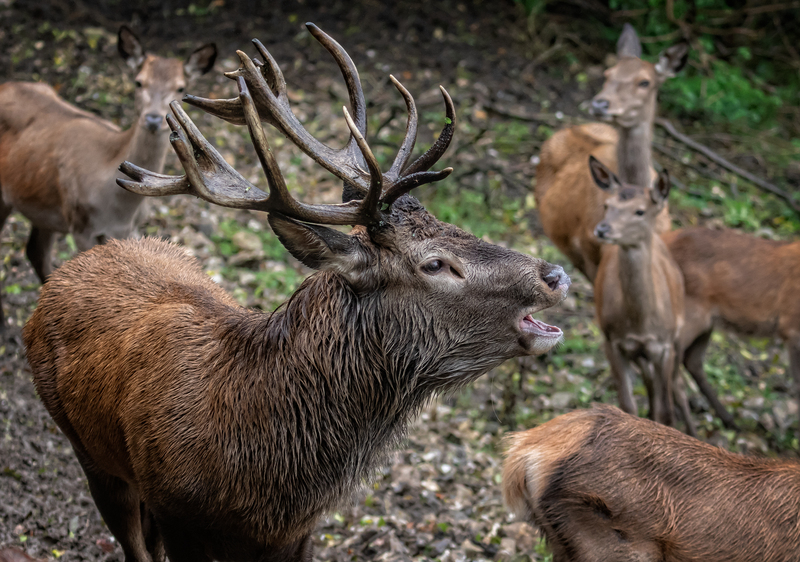 On Monday 15th October 2018 I went on a photography day with a friend to the South West Deer Rescue Centre near Crewkerne in Somerset. 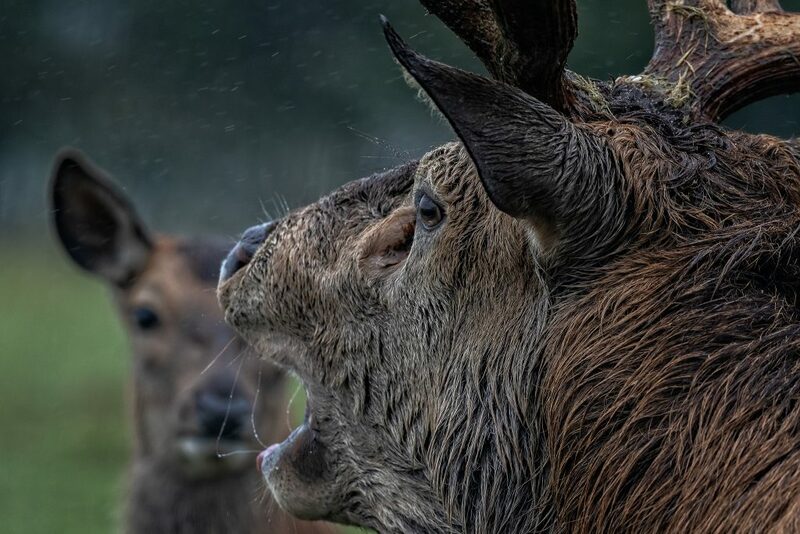 We had planned the day in June and we met the photographer James Brown who would be help us for the day and give us tips on how to get the most out of our wildlife photography. The weekend had been very wet and the Monday continued the same but the workshop would still go on! We left home with more waterproof gear than photography equipment ready for what the day would throw at us. We met Jim at Crewkerne station and travelled with him to the Rescue centre which was a little out of the way. It was situated in the heart of the Somerset countryside, where on a clear day you could see three counties, Somerset, Dorset and Devon from the top of the rescue centre. Unfortunately because it was raining so hard there was mist and low cloud covering the landscape, some would say atmospheric, but I would have loved to see the view! A good excuse to go back another time. 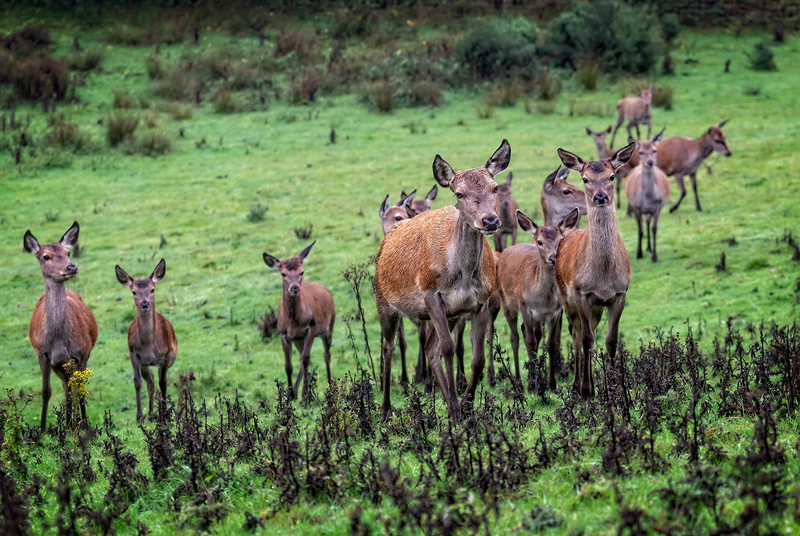 We were taken on a walk round the centre with Jim and Mike, the owner, known as the Deer whisperer. 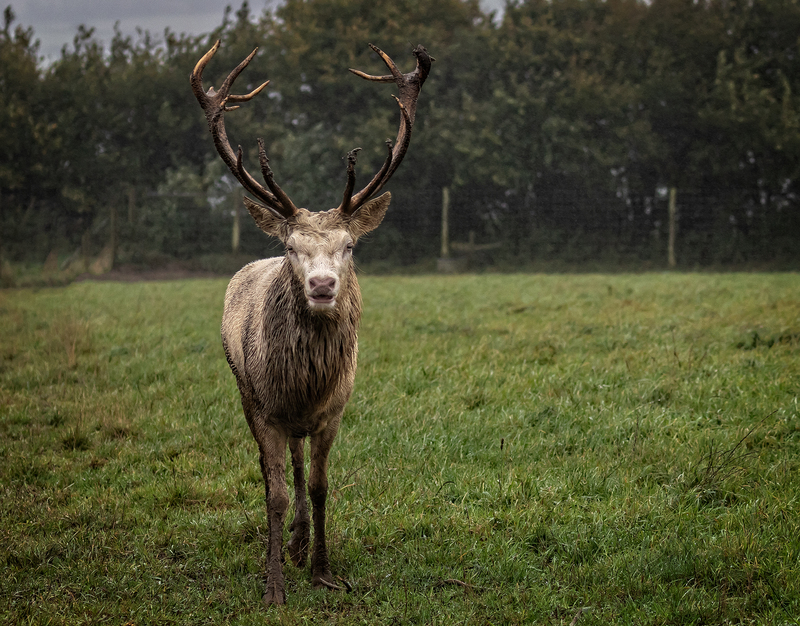 He has been working with deer for 40 years and had the rescue centre for 7 years so he was very knowledgeable, we learnt as much about the deer as the photography which was great. 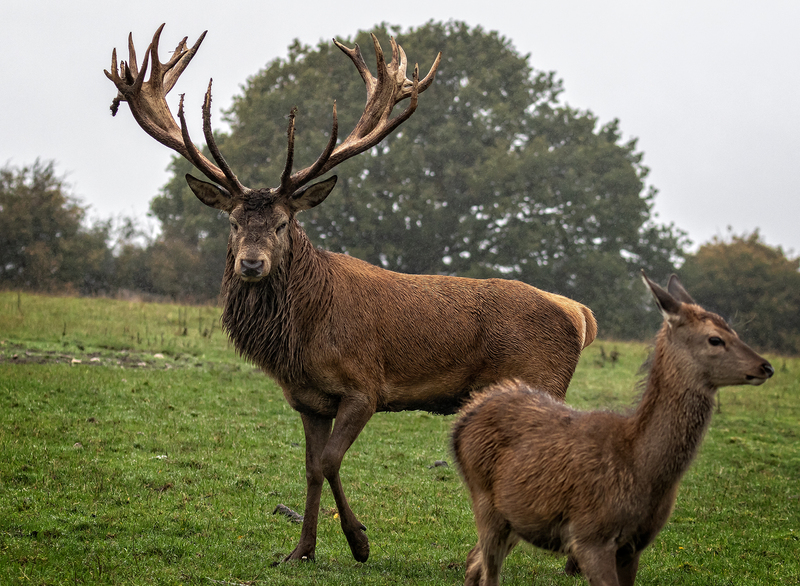 The deer had large paddocks to roam in and looked very healthy and happy, one of the deer was 28 years old, which is very good for a deer. Our first encounter was walking through the Fallow deer, they were very gentle and were trotting along beside us and allowed us to touch them. Jim told us how to get the most out of our images in the wet weather, using manual settings and keeping the aperture wide open and changing the shutter speed and ISO settings to allow us to get a good exposure, although at times it was challenging with the rain and low light and we were taking images hand held so we had to be aware of camera shake. I was carrying my 100-400mm lens I think I could have used a smaller focal length lens but I had to work with what I had as once we were out and about there was no way we could change lenses in the wet. 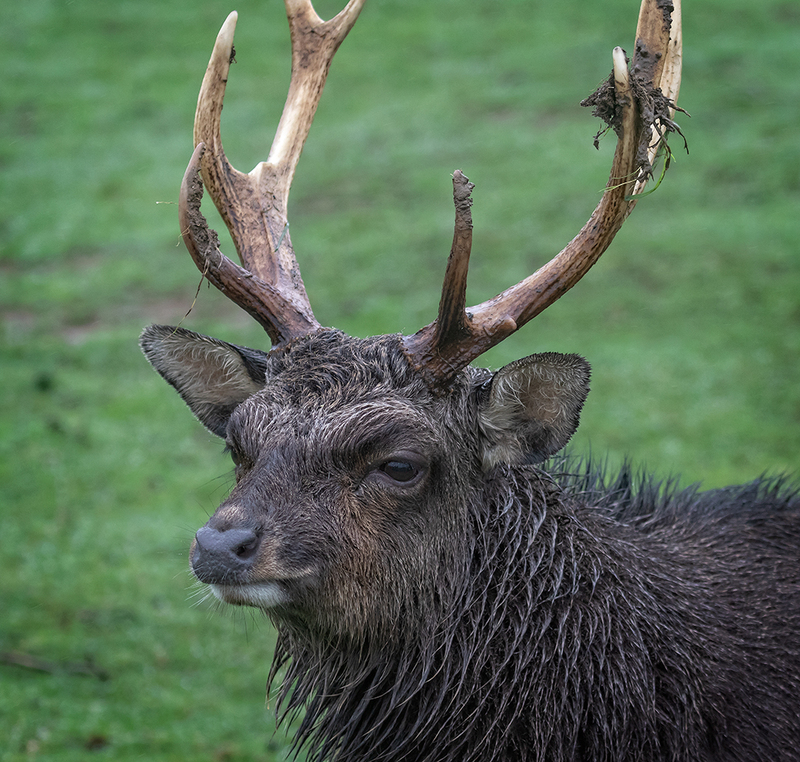 We walked up the path to an other enclosure which we couldn’t go in as there were Sika deer including Stags in rut so quite feisty at times. 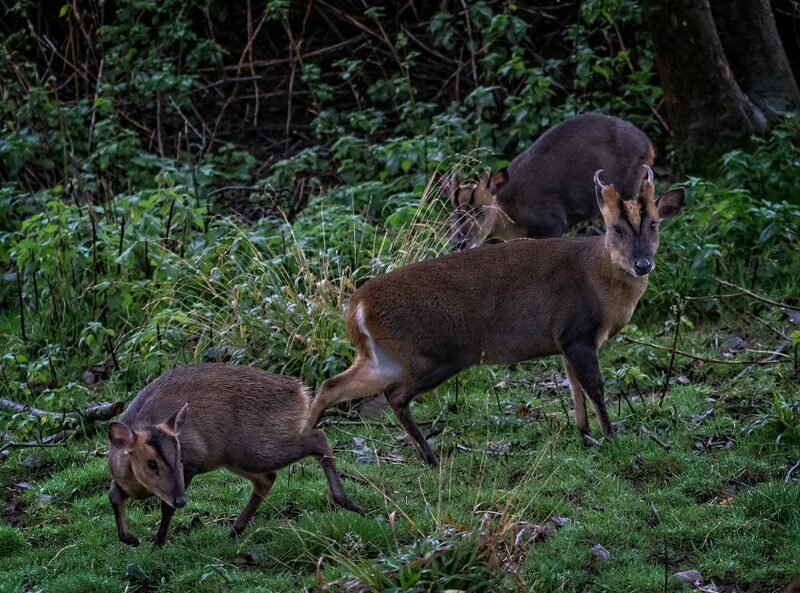 The Sika were Japanese Sika and I noticed they were much smaller than the Sika I see at Arne, which are apparently Manchurian and the largest of the subspecies. 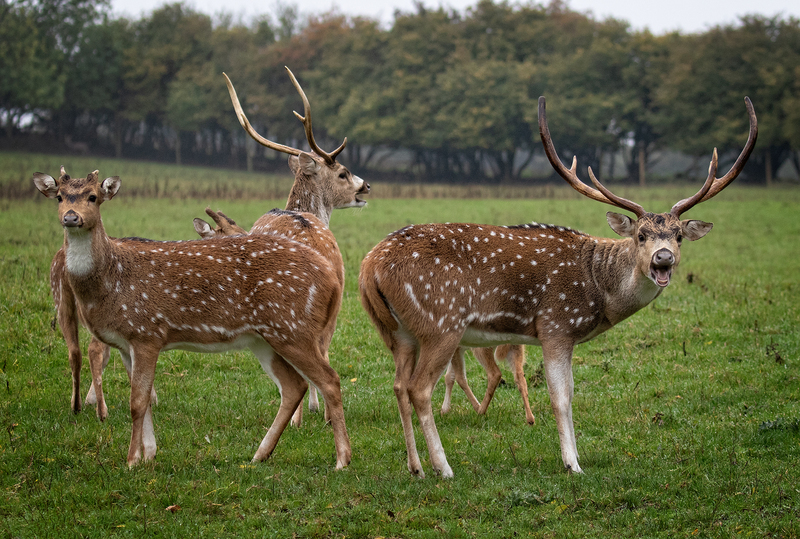 There were also a small number of Axis deer, not found in the UK, a native of the Indian continent, a very attractive deer. 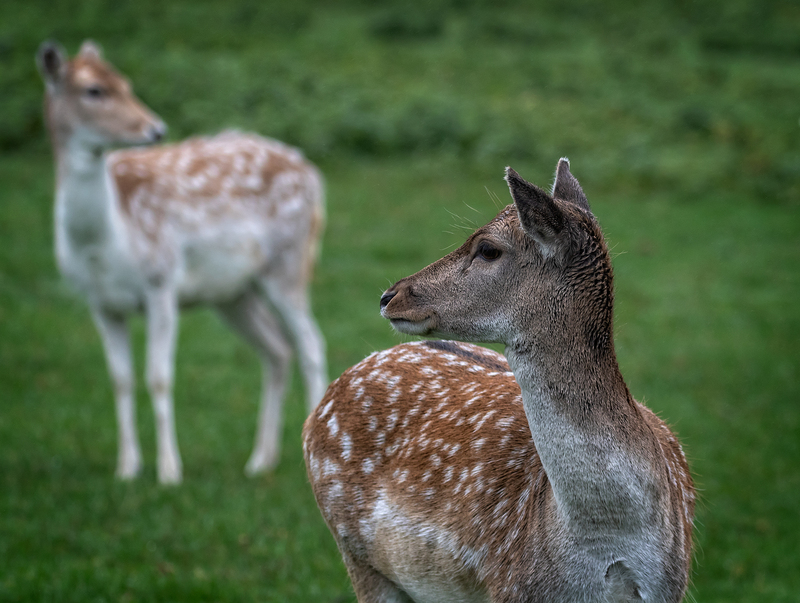 As we were walking up by the enclosures we were accompanied by a couple of Fallow deer it was like have a couple of Labradors by your side a lovely experience! Our next encounter was a small herd of Muntjac deer, I know they are around our area but I have never managed to see one in the wild, so I was so pleased to see them close up. I can understand why I haven’t seen any before they are in an enclosure with trees and bushes and when you get there they are no where to be seen. Suddenly they are there, then just as quickly they melted away into the undergrowth, just allowing us time to take a few images. By this time the rain was pouring down, we were climbing up the hillside and it was getting windier so it became even more challenging, up on the hillside. We were where I was looking forward to seeing the Red Deer up close. 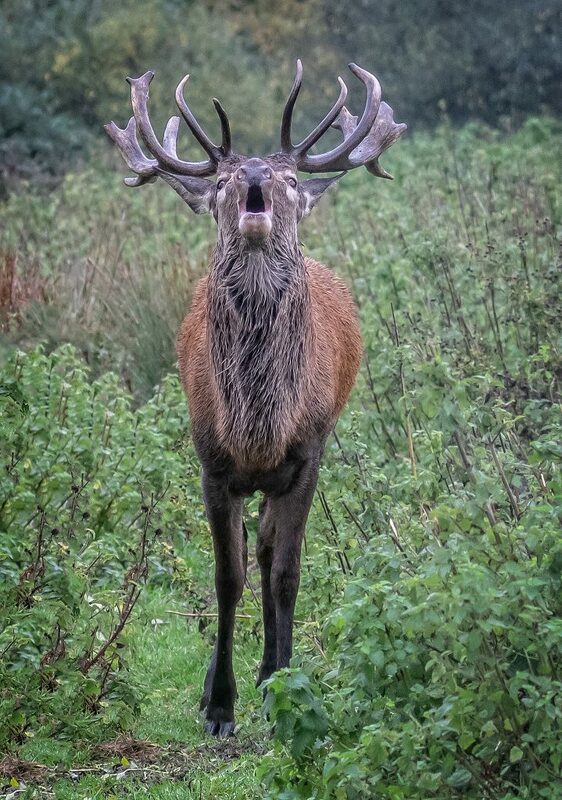 We had already heard them as they were also in rut and the Stags were staking their claim to the hinds by baying very loudly. A few of my images were taken with my lens covered in rain but I managed to recover them in Adobe Lightroom! The two images below show the original with no post processing, how ever much you tried it was impossible to keep the rain off. The second is with minor tweaking in Lightroom, not a brilliant image but acceptable. There was a shelter near the top of the hill and we had a break and tried to clean our lenses, not easy as everything was damp including ourselves and then we set off again. 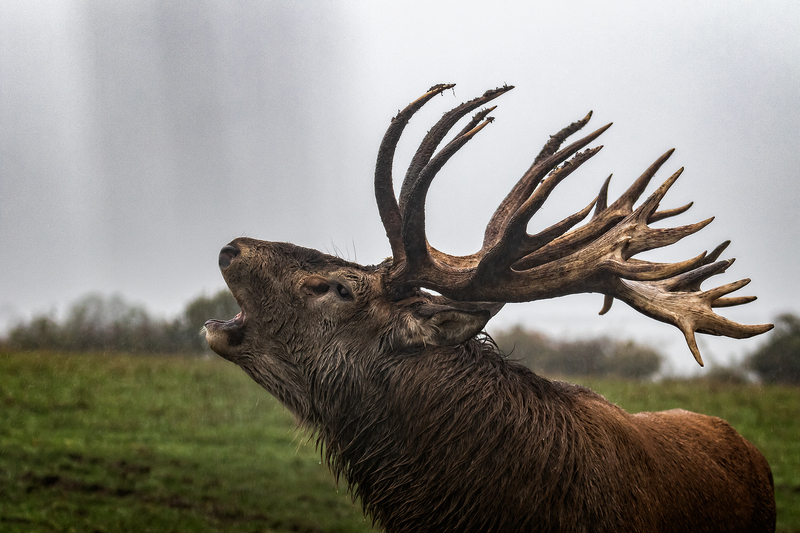 The image below is one of my favourites of a really close up of a Red deer Stag’s head as he’s calling with the hind behind him and the rain coming down. We went a little farther up the hill and were able to go in with a herd of Sikas, we were in the trailer on the back of Mike’s Quad bike so we could really get close. Jim took a photo of myself Mike and Jayne, all looking very wet but very happy! As well as the Red deer stags there was also a couple of white leucoistic Red Deer stags and they are quite rare. One was very feisty and even Mike was being very cautious around him, no going in the pen with him! Mind you he didn’t look very white in the wet weather! We were then over the hill and walked into another valley, it would have been beautiful views if it wasn’t for the low cloud and rain. There was a large herd of Red deer roaming in the valley, a couple of Stags, one magnificent stag, which was obviously in charge and top man! We had an enjoyable walk down the hillside, it was a little more sheltered and a good chance to take some photos. What a great day we had, the weather was just part of the experience. Jim and Mike made us feel welcome and the photography was challenging but I think it added to the experience. After we finished Jim took us to Broadwindsor Restaurant and Crafts centre where we warmed up with a lovely meal and chatted about the day and all things photography. I would highly recommend this photography experience day. I've set up these blog pages to write some thoughts on my photography and also about the area where I live, which influences my photography. Of course it will include any trips/ holidays workshops to other places. If you would like to be notified when there is a new post use the Subscribe to Blog by email to the right of this post. You will only receive updates and you can unsubscribe at any time. If you enjoy what you see I hope you will return. We have some lovely green lanes round the village besides many well looked after footpaths so I can always find a different route to go each day, although I do have my favourites. This particular frosty morning I went down Greenway Lane across the field to Netmead lane, then across the road to Ridgeway lane….